You can now order Kerrang! 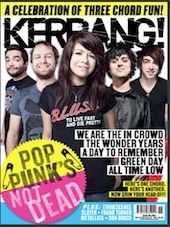 magazine's latest issue "Pop Punk's Not Dead" from our Merch page. The "special issue" contains a feature on Green Day and their recent surprise shows and new songs. Check this post from earlier in the week, which gives some more information on what you can expect to find in the issue. There is a 15 track CD included, with music from bands such as My Chemical Romance, New Found Glory, and Taking Back Sunday. The magazine is available from GDA for $6, plus shipping. We've kept the price as low as possible to be fair to our visitors, while covering the costs to the site of making them available worldwide. If you're interested in buying a copy, we have a limited amount in stock, so head on over to order yours here.